A terrific musical instrument ! The Brodur/SebCharlier are far more than any simple signature model. 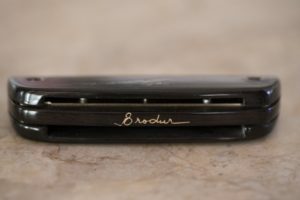 This harmonica is the fruit of a truly effective joint effort between Raymond Brodur, who brings design and woods, and Sébastien Charlier, who fine tunes the instrument according to the harp making and what it brings to your playing and sound. The new model brings a rather important design change. It provides a bigger visual impact than the previous harps thanks to its Golden Melody shape and its flat cover plates, en hanging the quality of material. As usual, the finish is perfect, and sliding is killing. Cover plates can be stripped down separately. 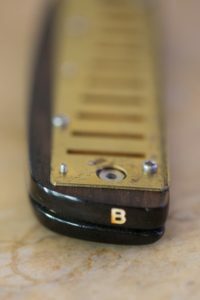 The specific design of this harmonica shows some kind of grooves on each side of the reed plates. 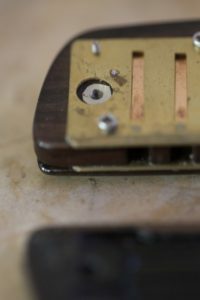 These grooves shouldn’t be an issue I guess, and they should stay clean from rubbish and I really like how it looks. 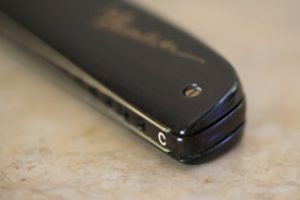 The shape of the harmonica provides an easy grip, very different from the previous models. Anyway, I guess it’s a matter of personal taste (Golden Melody vs Marine Band). When it comes to playability, this one goes way farer than any other harp I’ve played before. Everything goes sweet, response is very consistent all along the harp range. Overblows and bends can easily be shaped (sound and attack). 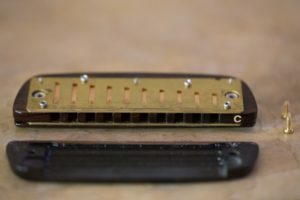 These features make this harmonica perfect for fine chromatic playing. 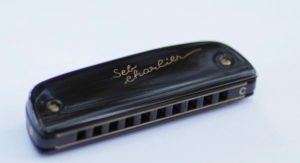 It makes complex melodies much easier to be played than on a standard harmonica. The mix of its design and Raymond’s expertise in harp making produced an excellent instrument. Sebastien’s fine tuning will get you over the moon ! According to me, this harp is clearly the most impressive harmonica for chromatic playing.